NUFC set to receive ‘£20m offer’ – & Rafa could do a deal on ONE condition – Report – NUFC blog – Newcastle United blog – NUFC Fixtures, News and Forum. According to the Chronicle, West Ham are readying a £20m bid for Jonjo Shelvey this summer – a deal Rafa Benitez could be open to provided he’s given the money to replace him and reinvest in the squad. Barely a window (or month!) goes by where West Ham’s interest in Shelvey isn’t reported, and although both Benitez has shown no interest in letting him go over the past few seasons, the emergence of Sean Longstaff may have changed things. 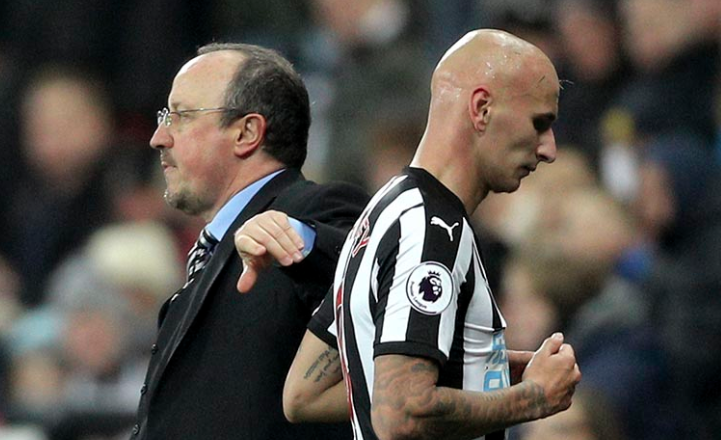 “Newcastle United boss Rafa Benitez will want assurances that Jonjo Shelvey will be replaced this summer if the Magpies decide to cash in on the midfielder. “The Shelvey situation is just one of a number of items on the agenda behind the scenes at Benton at the moment. “Sources in the capital have suggested that a £20million offer is on the table for Shelvey after he slipped down the pecking order at St James’ Park. “West Ham are ready to reignite their interest in Shelvey this summer and offer him a route back to London. “The 27-year-old was on West Ham’s wanted list in the January window, but the Magpies were not interested in moving him on at that stage. “But as United start to look towards next season and bringing in new blood, that stance could change. This is a difficult one. No matter how good Jonjo can be on the ball when he’s playing at his best, there’s always that lingering fear that he’ll switch off defensively or lack that work rate and intensity Rafa likes from his midfielders. If he’s not getting played week in week out – which is a distinct possibility if Longstaff keeps playing as he has been and a new midfielder arrives – then he may be seen as too much of a luxury to have sitting on the bench; especially when West Ham are willing to pay £20m. For me it all comes down to how we invest any money received for him. He’s one of our best players when he’s in the mood and undoubtedly one of the most gifted footballers at our club, but we’ve seen Rafa sacrifice a ‘star man’ in the past and still end up improving our starting 11. For if Rafa is gone then the next guy will be a certain yes man to Ashley and then Ashley will sell all viable assets for as much as he can and give any new man peanuts to buy replacements. However: Rafa stays so yes sell Shelvey because we will have enough cover with Ki, Longstaff Hayden (if he stays) plus if rumours are true we will have a fine replacement in Mooy. Even then we can even use Schár in midfield. But as I said at the begining who knows what is happening within Newcastle United FC these days??? Make it 30 and we’ll think about it!